Red, ripe tomatoes, buttery toasted bread, fresh basil leaves and a healthy dose of grated parmesan cheese... what's not to love? These are the main components of Scalloped Tomatoes. The original recipe calls for using plum tomatoes but any sweet, ripe tomatoes will work just as well. I also substituted the fresh basil leaves in the original recipe with homemade pesto so that I could get the basil flavor more fully incorporated in the dish. 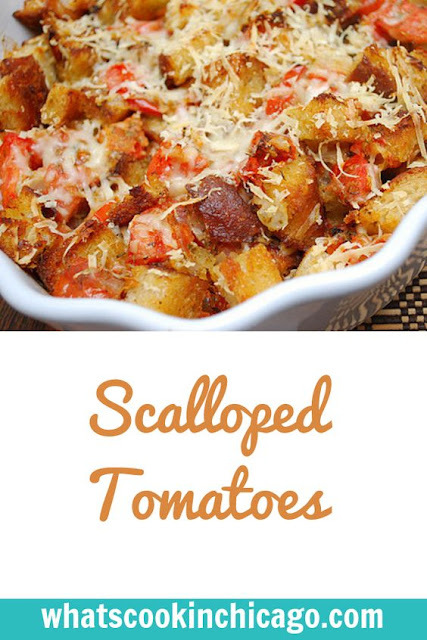 So if you're looking for a recipe to use up those sweet summer tomatoes, this would be it! Heat 3 tablespoons of olive oil in a large (12 inch) saute pan over medium heat. Add the bread cubes and stir to coat with the oil. Cook over medium to medium-high heat, stirring often, until the cubes are evenly browned. You want the bread cubes to be fully toasted just like croutons so that they don't turn mushy when baked. Meanwhile, combine the tomatoes, garlic, sugar, salt, and pepper in a large bowl. 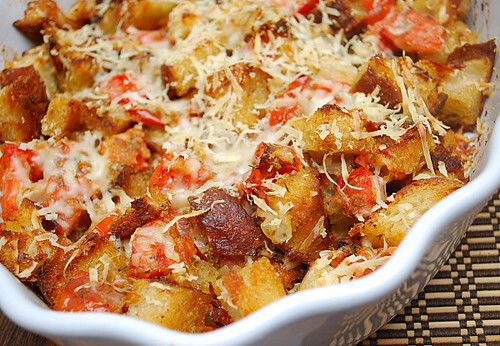 When the bread cubes are done, add the tomato mixture and continue to cook, stirring often, for 5 minutes. Off the heat, stir in the pesto. Pour the tomato and bread cube mixture into a shallow (6 to 8 cup) baking dish. Sprinkle evenly with the Parmesan cheese and drizzle with 2 tablespoons of olive oil. Bake for 35 to 40 minutes until the top is browned and the tomatoes are bubbly. Serve hot or warm. I love food specially when tomato is added, well, except broiled tomato. Yum, now I feel hungry! This looks fabulous! I can't wait to try it! This looks perfect for all those summer red ripe tomatoes. Joelen, I just realized I've never commented on this post. Since you posted this, we have enjoyed it numerous times! It's a great go-to side this time of year when tomatoes are abundant. We're having it with the chicken parm meatloaf tonight! This looks really tasty. Great photo and recipe. Love tomatoes.